Do not hesitate to contact us if you have any questions regarding the insurance products we offer or if you need assistance with your application. Arizona, Arkansas, California, Colorado, Connecticut, Delaware, Florida, Georgia, Illinois, Indiana, Iowa, Kansas, Louisiana, Maine, Maryland, Michigan, Minnesota, Missouri, Nebraska, Nevada, New Jersey, New York, North Carolina, North Dakota, Ohio, Oregon, Pennsylvania, Tennessee, Texas, Utah, Vermont, Washington, Wisconsin, Wyoming. 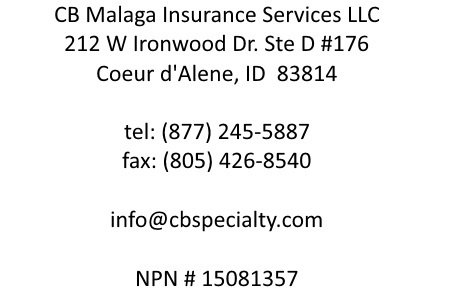 © CB Malaga Insurance Services LLC - Professional Liability Insurance, Errors & Omissions Insurance, E&O Insurance, E and O Insurance. Providing professional liability insurance and errors and omissions (E&O) insurance to accounting professionals.